Now introducing Shopclues Boomerang Sale, New sale by Shopclues where you can buy lot of Products at Rs. 199 + Rs. 100 Shopclues Cluebucks and also get 1% cashback with Payumoney Payment. Cluebucks will be calculated basis 50% of the deal price from Boomerang sale. Boomerang sale offer is valid on both prepaid and cash on delivery orders. Cluebucks earned will be valid for 5 days from the day of issuance. Offer valid only on Boomerang sale products only. 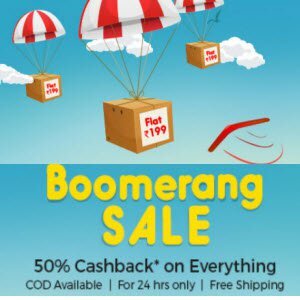 How to get Shopclues Boomerang Sale? Rs. 100 Cluebucks will be added after delivery of your products. Use cluebucks with in 5 days of issuance or it will be expired.